The Corn Palace was first drawn to BioSurf® for its corn-based composition. Today, they buy because of its proven durability and visual appeal. BioSurf by Biovation is an eco-friendly decorative laminate that uses custom digital printing to offer design flexibility to architects, interior designers, building owners, and product fabricators. The Corn Palace (Mitchell, SD) was founded in 1892 to showcase regional agriculture while providing an entertainment venue. Today, the facility also supports concerts and sporting events which attract 500,000 tourists annually. Known for its design artistry, the Corn Palace is completing its largest renovation ever, featuring wall murals to provide both function and aesthetics. "To cultivate the overall theme of this project, we researched if any corn-based building materials exist that would also meet our functional design needs," said Eric Amel, architect for Minneapolis-based Meyer Scherer & Rockcastle. "I discovered BioSurf and immediately gave Biovation a call. It was not only corn based, but provided an ideal set of attributes — bio-based to provide high sustainability, no red-list materials to optimize public safety, and digital printing to offer image customization. This combination made BioSurf the clear choice for the project." "The custom-digital aspect of BioSurf was very appealing," said Amel. 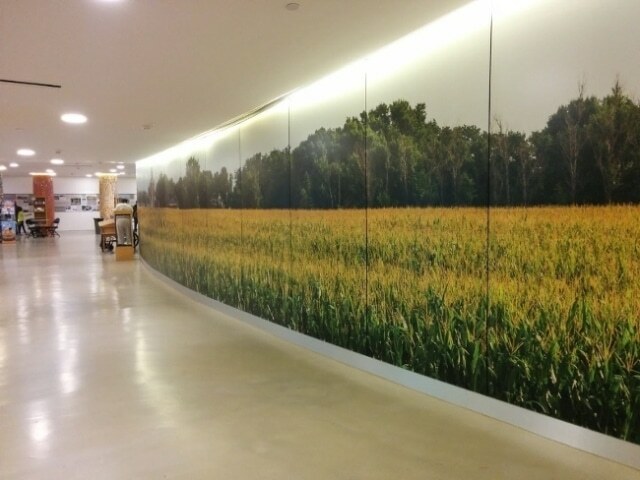 "We wanted the lobby to feature photomurals of past palace exteriors, a corn-field panorama, and a historical timeline - all expanded to large scale. BioSurf enabled us to make all of these ideas a reality using a durable surface at an affordable price." "We are extremely pleased with how the BioSurf panels turned out," said Terry Johnson, Deputy Director of Public Works for the City of Mitchell. "Visitors routinely take photos beside the BioSurf wall panels given the images are so relevant and striking - they are a huge draw." "In practice, we find the durability of BioSurf to be equally impressive," said Johnson. "We get a lot of visitors per day which previously led to scratches, markings, and other wall damage. Now, we never see damage where we use BioSurf panels. In fact, we are installing more BioSurf on the lower four feet of high traffic areas to keep our walls clean. While the corn-component of the BioSurf story matters to us, its overall performance is its selling point for us today."